Simone LaDrumma is unique in the world of entertainment. She is available to add her off-beat (so to speak) brand of humor and her powerful drumming to your event – party, retreat or convention. While Simone’s amazing drumming appeals to everyone – men, women, kids – her humor is often about the vicissitudes of aging. When she was a little girl, Simone found she had the ability to make people laugh – and she really loved that. She also had a natural talent for mimicry and enjoyed doing send-ups of popular celebrities of the period (Late 40’s, early 50’s) for her family. Fast-forward half a century or so (mostly “so”), and Simone is still trying to make people laugh… sometimes unsuccessfully: “I’m really a very funny person. It’s just that some people don’t realize it”. the idea of combining drumming and comedy? 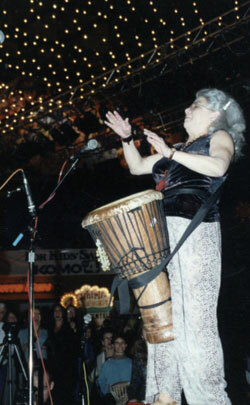 ME: Well, I’m aware that the sight of a little old lady playing that big ol’ djembe drum is beyond weird and gets everybody’s attention right away. Wow! A ready-made audience! It began one day at a performance in Everett (Washington). I walked out on the stage and my drum was sitting in the middle of the stage. I arranged the straps and slipped it on. It protrudes like a gigantic phallus between one’s legs. You could hear a pin drop. I looked at the audience and said, “Remember when this was an apron?” and everyone roared. That’s when it dawned on me, “Hey, I think I got something here! I: Where do you get your comedic ideas from? ME: Mostly from the tragedy…er…miracle of aging. If you don’t find some humor in the rotting – strike that, I meant aging – of the body and the mind, you are pretty well screwed. Although, to be perfectly honest, I wouldn’t mind being pretty well screwed at this point. I: Any favorite past highlights for the Stand-Up Drummer? ME: I was selected to perform for a talent show put on by The Stranger, Seattle's alternative newspaper and also for Bumbershoot’s Got Talent. Bumbershoot is, of course, this ginormous arts festival held every year at the Seattle Center. I was one of nine people picked to compete and I made it into the finals. I came in third, but considering that the winner was a 9-year old boy juggler, I felt pretty good about that. Honestly, I think I made it into the finals because there were two emcees, both comics from New York (yay), and at the end of every act they would stand on either side of the contestant and ask a few questions. Well, I was still wearing my drum and whenever either of them said anything even remotely humorous, I would give them a loud BA-DUM-BUM on my drum, which caused the audience to laugh, which pleased these guys no end. enjoy it the most, do you think? Add rhythm and giggles to your retreat, event or meeting!